Sugar is in most of the foods we eat on a daily basis. 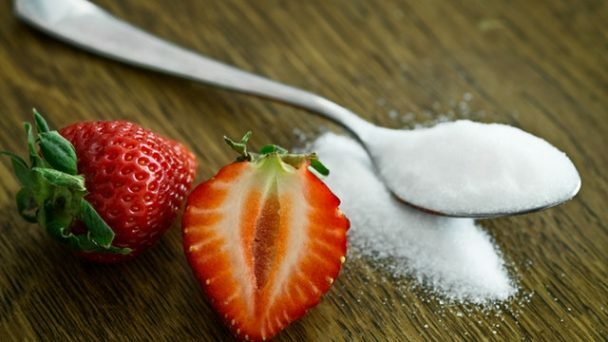 Not all sugars are bad; naturally occurring sugars, such as those found in fruit and some vegetables, often come with other nutrients like fibre and vitamins and should be part of a healthy diet. The real enemy is refined (white) sugar which is added, rather than naturally present. Most people know that processed foods and many carbonated drinks contain refined sugar, but it can also be found in tins of beans, white bread and tomato ketchup. You may be surprised to learn that many of us consume the equivalent of 53 heaped teaspoons a day of white sugar. Your pancreas produces insulin which processes sugar and keeps your blood sugar levels stable. When you consume added sugar, more insulin is needed, and the pancreas must work harder to produce enough insulin. If the pancreas is overworked and is unable to produce enough insulin to eliminate the sugar from the blood stream, the result is diabetes. Sugar reduces the efficiency of white blood cells in the body for up to 5 hours. White blood cells support immunity and so, consuming too much sugar can reduce your body’s natural immune system. Excess sugar consumption has been linked to hyperactivity in children. This is as a result of the potential link between excess sugar and increased adrenaline. Sugar creates an instability in blood sugar levels, until levelled out by insulin. The result of this can cause sugar highs and sugar crashes, leading to mood swings, irritability and anxiety. If you find it difficult to regulate your mood, or you are an anxious person, why not make an appointment to see our team; don’t rely on sugar as it won’t help! Consuming sugar can increase harmful cholesterol and decrease high-density cholesterol that the body needs. If you do like to add a sweetener to your food, or hot drinks, try to choose naturally occurring sugars, like those in honey or dried fruit. Alternative sweeteners can also be a good option but try to stick to sweeteners without harmful chemicals. Stevia is a good choice.